Dunn’s vision for 11th Ave. Contains mews. Two development projects destined to exist within one block of each other in Pike/Pine will take their turns this week in front of the East Design Review Board. But their proximity appears to be about the only thing the projects have in common. 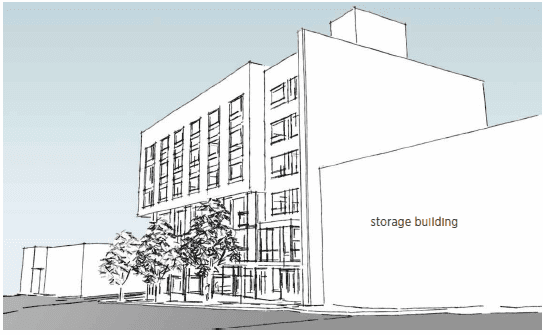 One project at the busy corner of 12th and Pike is envisioned as a 90-unit, mixed-use apartment building — replacing an older, organically developed “mixed-use” building at the site dating to the early 1900s. Meanwhile, across the street, much-celebrated Capitol Hill developer Liz Dunn appears set to finish her mission of redefining area development as she releases what will likely be the final vision for a innovative 11th Ave office and retail project designed to integrate her buildings along E Pike and 12th and provide a connective passageway through this corner of Pike/Pine. 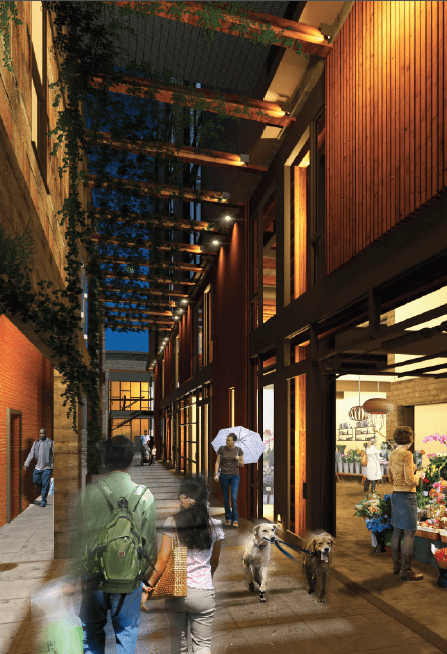 The project packet for this final phase of the design for Dunn’s 11th Ave development is sure filled with a lot of dogs for a building centered around a mews. We told you in November about Dunn’s plans to finish her vision for her holdings on the block of E Pike between 11th and 12th Aves — Finishing what she started, Dunn’s 11th Ave project designed to light up Pike/Pine’s days. Dunn’s backburnered project was originally intended to be housing-focused but, faced with the wave of apartment development hitting the Hill, the typically prescient Dunn zigged as others zagged and came to the table with a plan for a new Pike/Pine-era office, retail and restaurant building that will utilize the neighborhood’s preservation incentives to build to five stories on 11th Ave.
We only half-jokingly called it Melrose Market II last year. The old auto row-era structure currently home to Chophouse music studios is slated for a preservation-minded overhaul as part of the Sundberg, Kennedy and Ly-Au Young and Graham Baba designed project. 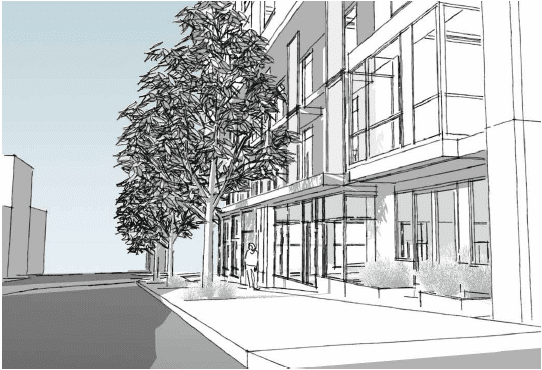 The Mews is envisioned as an open air connector between 11th Avenue and the Courtyard. Fronted by retail and restaurant storefronts, it is intended to feel like a classic pedestrian alley, a respite from the busy streets of Capitol Hill. Its secondary function is to allow space for light and air to neighboring buildings. In a previous version of the Master Plan, the Chophouse building was to be demolished in order to construct the Mews. In the current Master Plan, the Chophouse is retained, and the Mews lives within its eroded structural frame. Other area businesses will be reinvigorated by the project. In the renderings, you can see, for example, Cupcake Royale’s new window on the world as the backside of the bakery will become an alternative front within the Dunn project. The developer says the project’s courtyard and mews will be accesible from seven different neighboring buildings. The area will be closed and locked-off at night, according to the design packet. At Wednesday night’s design review, it won’t just be open space and cupcakes, however. There’s some serious talk that needs to happen around the project’s planned preservation components of the Chophouse structure — and the extra story of height Dunn plans to claim as part of the Pike/Pine Conservation District incentives. The project’s first spin through early design review in November just before Thanksgiving was mostly uneventful and enthusiasm for the project in the neighborhood seem solid. With Dunn typically on the front edge of the trends shaping Capitol Hill and the Bullitt Center as another example, be ready to see more office space and more plazas, corridors and, yes, mews before it’s all over. We should also note that CHS keeps a desk at Dunn’s coworking office space Agnes Underground. Consider it full disclosure — and acknowledgement that she understands the needs of a modern workspace. In December, CHS broke the news that investors had revived dormant plans to develop the northeast corner of 12th and E Pike. Wednesday, we’ll get the first look at what they aim to do with it. Purchased by the Investco Financial real estate investment trust in 2007 for $3.2 million and already rejected as an official city landmark, the 1900-era building at 1200 E Pike is destined to be demolished along with the adjoining Trading Post structure on 12th. Businesses including the Trading Post, Bombay Bistro and B and W Antiques as well as tenants of the apartments in the funky old building will be looking for new homes sometime in the next year or so these projects usually take to dig in. It’s a tough time for Hill Indian restaurants, by the way — CHS reported last week that Chutney’s will eventually be on the move to make way for a new apartment building on 15th Ave E.
The Ankrom Moisan-designed project at 12th and Pike is planned to stand six stories and will not incorporate any of the existing buildings at the site. It will include 4,000 square feet of street-level retail and the plan is to have underground parking for 38 vehicles. At this first step in the process, the preferred design option isn’t much to look at — but you get the idea of just how much space it will fill at the corner and along this stretch of reaching-for-the-sky 12th Ave. This entry was posted in News, etc. 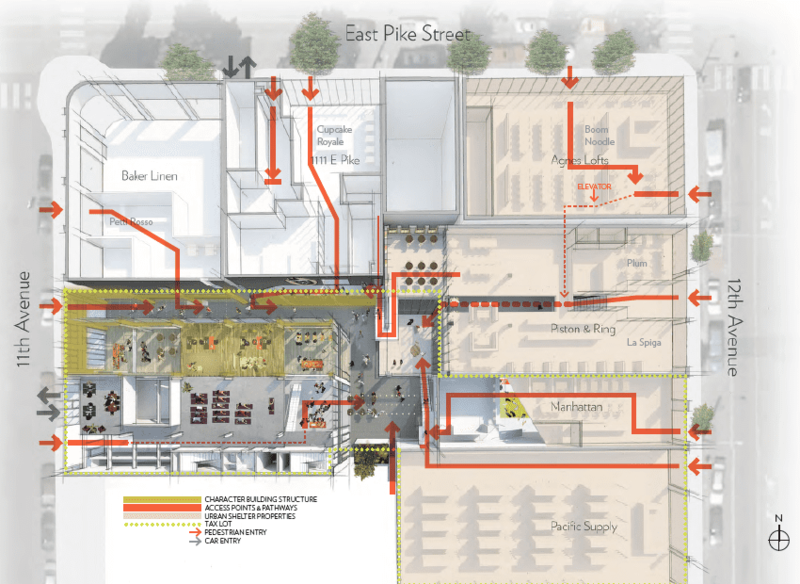 and tagged design review, development, liz dunn by jseattle. Bookmark the permalink. I like the idea of The Mews; small alleys fronted with shops are such a treat to discover in other cities from London to NOLA. Though I know a newly manufactured version won’t have the same aesthetic, it feels ‘new’ for the Hill and the front of the building looks to be varied enough to counteract the mass. 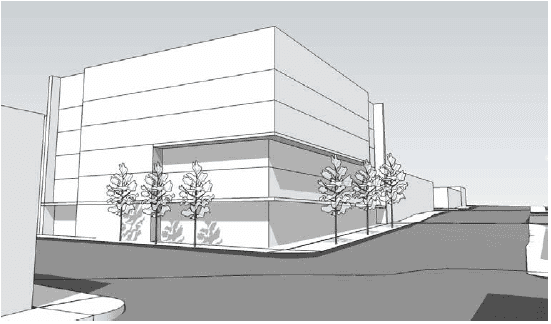 Cautiously optimistic, since this is one of the multiple proposed projects in my viewshed. The Mews looks amazing. The Ankrom Moisan thing not so much. The preview sketch is clearly designed by someone who does not live in Seattle. As you can see the individual in the picture is holding an umbrella,..people in Seattle do not use umbrellas. Concerned about the use of the Mews if it doesn’t connect as a true alley would on the other side. I suspect this will limit its utility as a pedestrian thoroughfare and constrain activity.